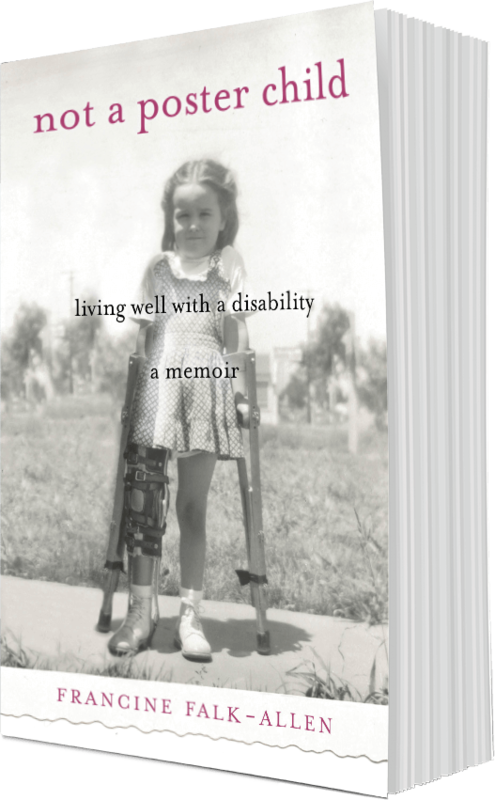 Maybe having polio also caused me to in some ways be more compassionate, yet in some ways more objective or maybe even less forgiving about what people say they cannot do. I have a harder time believing that statement, “I can’t do it, I could never do it,” having found that I could do far more than I ever thought I could, because I had to — though now it is physically true that there are more things that are truly impossible for me to do. There is so much I had to do just to function, so much I would have preferred not to have to do, but it was that, or miss out on life. With maturity, I have also realized that people can be psychologically or emotionally handicapped as well; there can be something within that creates a barrier to accomplishment. But for me, that type of limitation has always seemed surmountable (barring schizophrenia or panic disorder, though I’ve known people who worked through panic disorder), whereas permanent paralysis is a different circumstance… it just dictates some very literal impossibilities. I know there are people with two paralyzed legs who have scaled mountains with the help of others. Paralympics. A president who contracted polio and stayed in office. I’m not talking about that heroic stuff we all hear about, I’m talking about it being impossible for those same guys to actually hike, with their legs, up those peaks, or stroll into anyplace at all, whether a hall at the White House or a shopping mall, without a wheelchair, an exoskeleton, a walker, a cane, or crutches. For me, strolling anywhere is nearly impossible without a cane or crutches. A scooter is far more realistic. So that’s how I define “I can’t;” to me, it’s physically literal.